Style Source Magazine | Rusk Deepshine Oil Finishing Hairspray 10.6 oz. Home /	Brands / Rusk Deepshine / Rusk Deepshine Oil Finishing Hairspray 10.6 oz. Rusk Deepshine Oil Finishing Hairspray 10.6 oz. Traditional aerosol hair sprays can be drying to hair. Knowing this, Deepshine? Oil hairsprays were formulated with just enough pure argan oil and marine nutrients to create a best-of-both-worlds finish. Delivers extra-strong hold, coupled with weightless conditioning for a lasting finish. Hair remains soft and touchable rather than rough and/or dried out. Mist on dry hair to set finished style with extra-strong hold and shine. 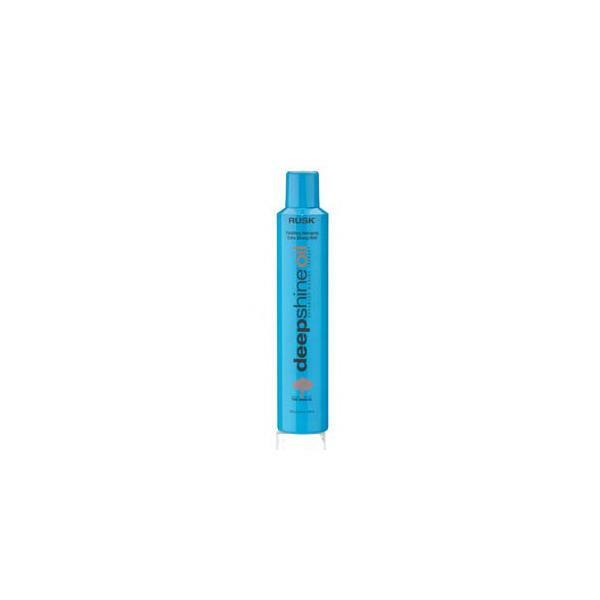 Deepshine Oil Moisturizing Shampoo 8.5 oz. Deepshine Oil Moisturizing Conditioner 8.5 oz.